When a man is found tucked up in bed with his throat sliced open two days after Christmas, DS Jason Smith and his team are baffled. It appears he has been drugged, killed and carefully wrapped up in a duvet. The only evidence Smith finds are some strands of hair belonging to a woman. One month later, another man is killed in exactly the same manner but there appears to be no link whatsoever to the two men apart from the fact that they were both single, lonely and middle aged. In the midst of the worst winter in years, Smith and his team quickly run out of ideas and tensions between the detectives rise. Frustration leads to conflicts both at work and in their personal lives. The only clue the team have is the murders were carried out under the glow of the full moon. Just when Smith feels like he has reached the end of his tether and his own sanity is declining, help comes from an unexpected source; a man who knew this woman when she was a young girl in the mountains of Northern Romania. He sheds light on the reasons these men had to die. Smith finds out who this woman used to be but who she is now is still a mystery. Haunted by lucid dreams and terrifying double awakenings, Smith stumbles upon something that will send him on a hunt for the most baffling murderer the people of York has even seen. 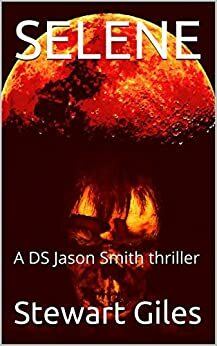 With time quickly running out before the next full moon and the safety of one of his closest colleagues entering the equation, Smith finally closes in on the most terrifying murderer he has ever come across. I have been a fan of Stewart’s for a little while now and I absolutely adore the series featuring DS Jason Smith. I couldn’t wait to get a copy of ‘Selene’ and dive straight in. Well blimey oh riley this is one hell of a scary but brilliant read. I absolutely loved it but more about that in a bit. What can I say about DS Jason Smith? He was born in Australia but he was sent to live with his grandmother following the disappearance of his young sister. Smith blames himself for her disappearance. I don’t think that blame can be apportioned to any one party as it was one of those tragedies that couldn’t have been predicted or prevented. Smith didn’t have much of a personal relationship with his parents and he saw his grandmother as more of a mother figure. They had a very close relationship and a very strong bond. Sadly she has now passed away but Smith thinks about her and misses her every single day of the year. ‘Selene’ sees Smith back at work following the horrific events of a previous book. I think Smith has come back stronger and cheekier. He doesn’t seem to have a filter and he literally says what he thinks even if that means he gets himself into the odd pickle or two. Smith is very good at what he does and he has a gut instinct that is almost 100% accurate. He gets on well with most people but there are a select few that I think he would class as friends. Smith works well as part of a team but equally he works just as well on his own. If something is a bit iffy or a bit dangerous then he puts himself in the firing line so to speak. Smith is a fair boss who wouldn’t ask anybody to do anything that he wouldn’t be willing to do himself. Smith has your back but if you drop a clanger that jeopardises either the case or members of the public or both then he doesn’t hesitate to let you know that he isn’t happy. This latest case presents Smith with a very complex puzzle and of course Smith has to come up with a solution. Will Smith solve the case? Can a murderer be stopped in his or her tracks? Well for the answers to those questions and more you are just going to have to read the book for yourselves to find out as I am not going to tell you. Oh my god this was one hell of a scary and unpredictable rollercoaster ride of a read. I was hooked from the moment I picked the book up and read the synopsis. It’s fair to say that I became addicted to reading this book and I was always in need of my next fix. I couldn’t bear to be parted from the book but if I did have to put the book down, I did so begrudgingly and I immediately started to count down the time until I could pick the book up again. I would pick the book up only intending to read a couple of chapters but that intention soon flew out of the window because I would still be reading the book a couple of hours later and many chapters down the line. The quality of the writing, the storylines and the realistic characters are all superb. Reading this book really was like being on a rollercoaster ride with twists and turns aplenty and several times I almost had to read through my fingers as I feared what was going to happen next. Silly me though because I realised that if I wanted to know how the story ended then of course I would need to read on. There is a fair bit of blood, guts and gore in the book but in my opinion, the blood, guts and gore isn’t gratuitous and is a necessary part of the story. In short, I absolutely loved reading ‘Selene’ and I would definitely, definitely recommend this author and his books to other readers. ‘Selene’ has to be my favourite book of the series so far. The series just goes from strength to strength. The score on the Ginger Book Geek board is a very well deserved 5* out of 5*.